The KTC244 Series Speed Rivnut Tools are designed for installing aluminum and steel rivet-nuts. These heavy duty hand tools are perfect for semi production, utilizing a high speed push, pull, with a smooth spiral action. Easy on and off threading of rivet nut with push pull knob. The KTC Wrench Style Rivnut tool is Ideal for occasional or limited use. Will also let you apply more pull-up force than is generally available from the lever type rivnut tools. Hold the body with a wrench and turn the pull-up stud with the supplied wrench. Metric sizes indicated by *. The KTC598 threaded insert kit will install a permanent aluminum threaded insert into material too thin to hold a conventional thread. The kit contains the installation tools plus mandrels and nose pieces for 6-32, 8-32, 10-24, 10-32, 1/4-20, 5/16-18 and 3/8-16 inserts. 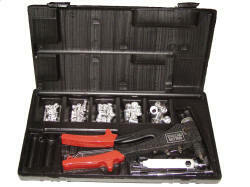 A small assortment of each size insert is also included along with a wrench, instructions and a handy molded tool case. The KTC300 Heavy Duty Pneumatic Rivet Shaver will quickly and effortlessly shave off the flaws and make the rivet head or screw flush to the surface. The unit has a 0.001” increment cut adjustment and operating speed of 16,000 rpm. Included is the stabilizer bar to keep the cutter on the rivet and a standard 9/16” capacity skirt. The KAT300K Pneumatic Rivet Shaver Kit includes the KAT300 Pneumatic Rivet Shaver, 7 rivet shaver skirts, 7 solid carbide blade rivet shaver bits and comes in a tool bag. The KTC series Solid Carbide Blade Rivet Shaver Bits are designed to shave high rivets and screws that protrude above the surface creating a flush head surface. Precision cut for chatter-free cuts and the carbide blade insure a long-life. The ¼” x 28 thread allows units to be used with rivet shavers, mirco-countersink cages, and angle drills. The Sioux Tools Pneumatic Rivet Shaver is ergonomically designed for comfort and safety. The 21,000 rpm motor makes it fast and easy to shave rivet heads. The stabilizer arms help keep the cutter centered and on the rivet head. The shaver skirt is adjustable to 0.001” increments, takes ¼” x 28 threaded shaver bits (unit accepts KTC221 series Rivet Shaver Bits & KTC220 series skirts), ½” skirt is standard, 3 lbs, 8.2” OAL.